A 3-year-old girl was found dead on train tracks in southern Spain on Thursday after her parents lost sight of her for just a few minutes at dinner the night before, police said. A three-year-old girl was found dead on train tracks in southern Spain on Thursday after her parents lost sight of her for just a few minutes at dinner the night before, police said. Lucia Vivar Hidalgo had been playing at a restaurant in the town of Pizarra not far from Malaga where her parents were eating on Wednesday evening when she walked off, a spokeswoman for the Guardia Civil police force told AFP. Her parents, both of them from the region, realised she had disappeared minutes later and started looking for her. 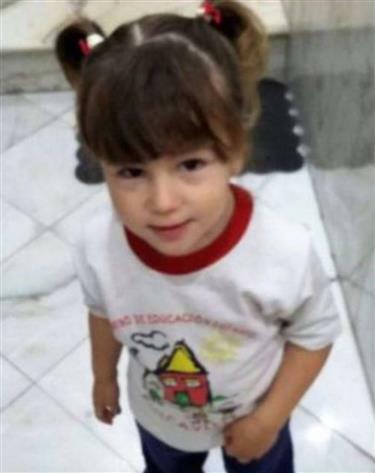 When they couldn't find Lucia, they enrolled the help of locals and around 60 police officers who searched for her at night with sniffer dogs. Police also issued a missing persons notice with two pictures of Lucia -- one of her smiling up at the camera with little pigtails. On Thursday morning, her body was discovered around three kilometres (two miles) away on the train tracks. "The preliminary theory pre-autopsy results is that the girl started to walk, at one point she got tired and went to sleep on the train tracks," the spokeswoman said, adding a train may then have hit her. When the alarm was raised on Wednesday night, Lucia's disappearance recalled the highly publicised plight of British girl Madeleine McCann, who vanished from her family's holiday apartment in southern Portugal in 2007 just before her fourth birthday.